African print fabrics come in different designs, colors, and styles. 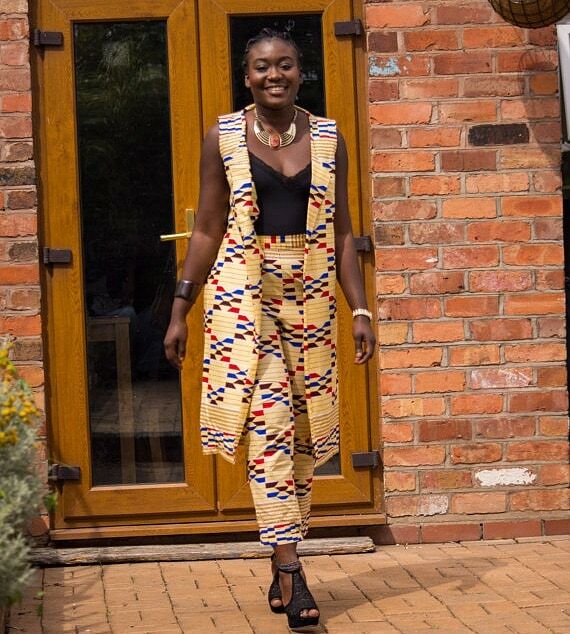 Some of the most notable fabrics are Ankara, Kente, Kitenge, Dashiki, Aso oke, and Batik. If you’re on a search for uber chic and fashionable ankara jackets, look no further. 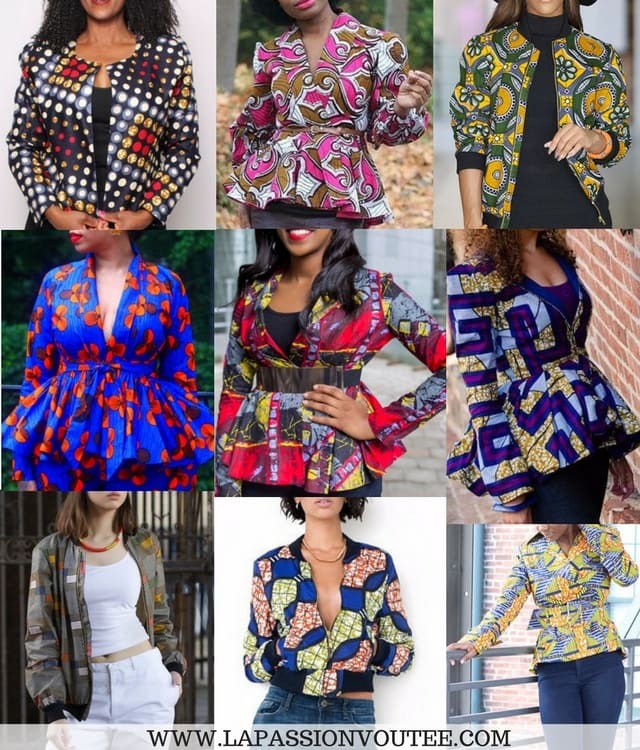 This post is a collection of some of the most stylish ankara jackets that I could find online. I try my best to keep this post updated. As you might know, African print designs sell out fast so by the time you find a an ankara style you love, it might be too late. I’ll share another major update to this post with newer styles PLUS where to get them shortly. Until then, check out my sister’s African print store. 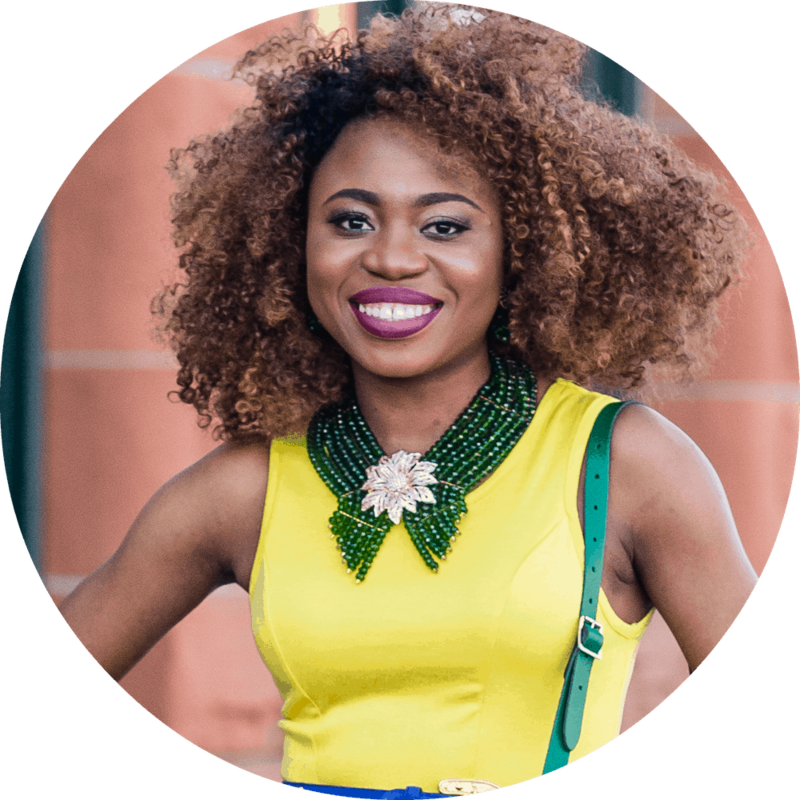 She sells high-quality, affordable, handmade and custom African print dresses and ankara bomber jackets. She also ships internationally. Need a custom design? Contact her here. It’s literally a nightmare seeing a piece you love without knowing where to purchase it from. I’ve linked all the jackets below to the respective seller’s store. Sold out/out of stock items will be updated with new/in-stock ankara jackets that I can find. I love African print a lot. Here’s a post with me in an Aso oke fringe skirt. I hope you enjoy this post as much as I did creating it! 1. Forest ankara bomber jacket by Gitas Portal – Bomber jackets are a great add on to transform a rather plain outfit. And this jacket from Gitas Portal is everything and then some! The print, colors, and cut just pops! 2. 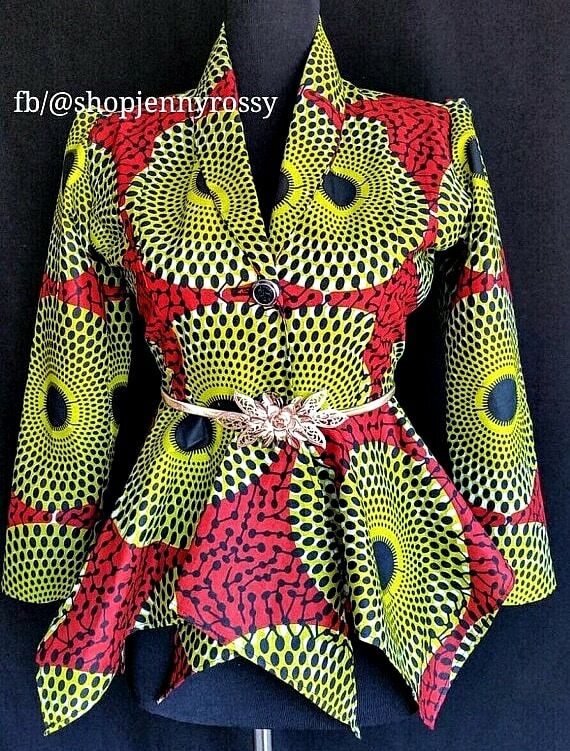 Princess blazer-style top by Jennyrossy – This versatile African print peplum blazer is so stunning! The print, asymmetrical cut, and collar makes it stand out even more. 3. 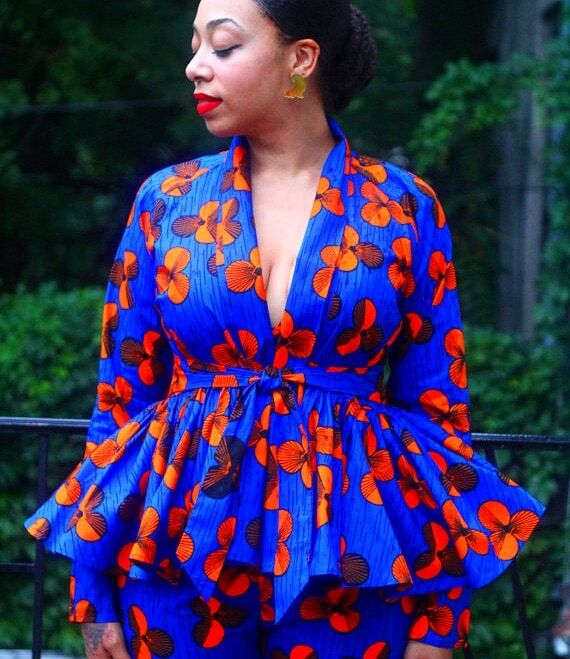 Ankara blazer coat by Sosome – In search of a one-of-a-kind jacket? Sosome got you covered with this drape style patchwork jacket. 4. 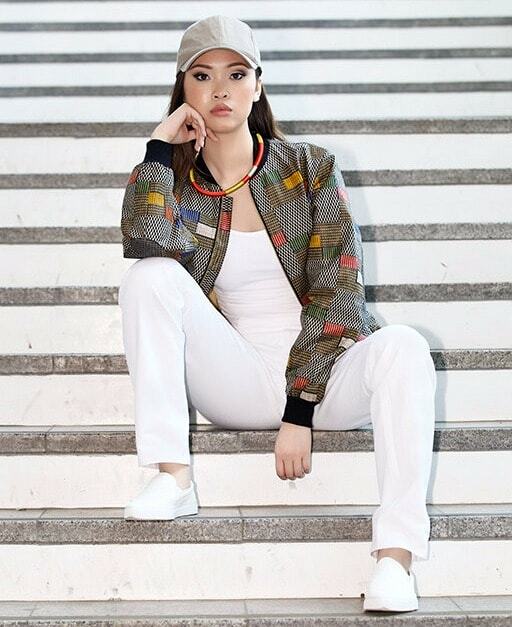 Wax print jacket by Kezziahs Wardrobe – The elasticized wrist of this jacket makes it look like a cross between a traditional jacket and a bomber jacket. A very neat concept! 5. The patricia jacket by Demestik – Totally blown away with this wrap cardigan jacket by Demestik. This brand always delivers exceptional African print pieces. Trade the Ankara skirt for a black or white work skirt for the perfect office look. 6. 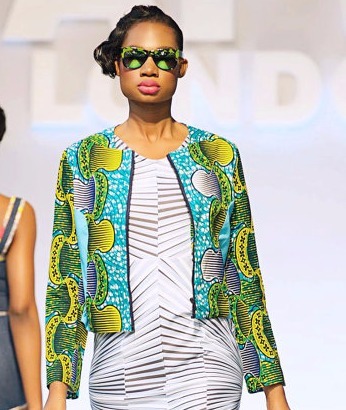 Lizzy jacket by Yetunde Sarumi – Get ready for non-stop compliments in this Yetunde Sarumi statement jacket. 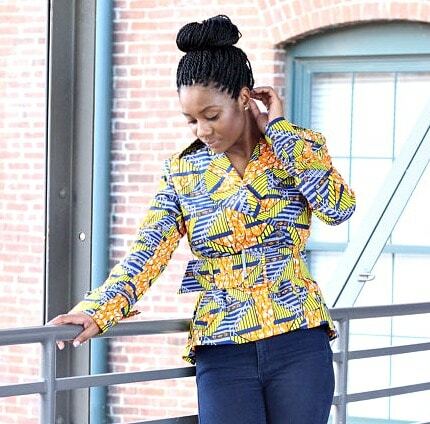 The oversized collar makes this Ankara jacket pop. I need this jacket in my life! 7. 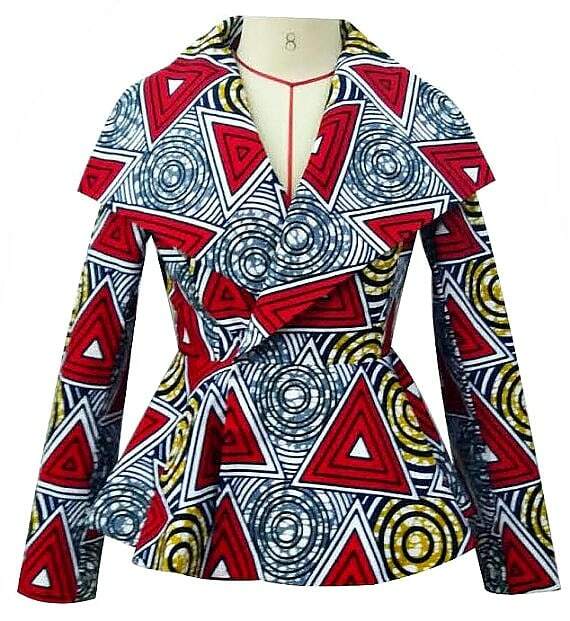 Farai peplum jacket by Kahaari – If you’re not for to go for African prints that jump out at your for being obviously African, then you want to get this jacket by Kahaari. The abstract African print makes it a more subtle Ankara piece and the rich colors retain the elements that make it an ethnic piece. 8. 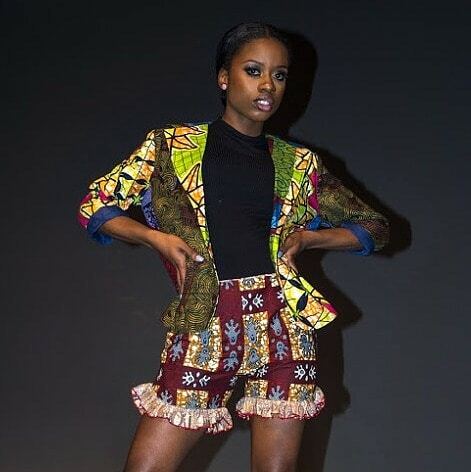 Eldior Ankara jacket by EldiorSD – If you want Ankara jackets that intricately incorporate different Ankara pieces together, this Eldior jacket is the way to go. It’ll make a great statement piece for an all-black (or solid color) outfit. 9. 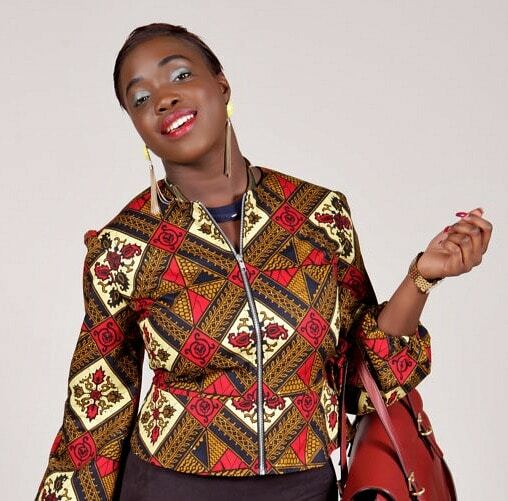 Berna wax print jacket by Aimeeku – Mais oui! Upgrade a boring outfit with this amazing wax print jacket. 10. 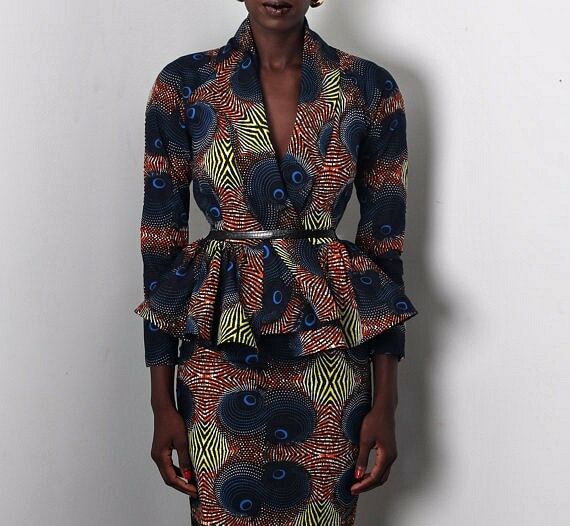 Drape Ankara jacket by Demestik – Demestik delivers again with this wrap jacket that is complete with peplum and semi-fitted at the waist to define your waist. 11. 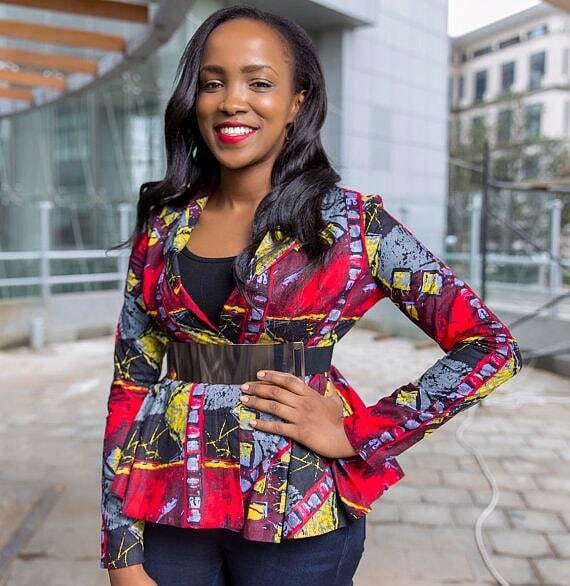 Crop jacket by Chenayii – Can’t get over this crop-style Ankara jacket. You easily wear it with denim and a pair of sneakers for an athleisure feel. 12. Ankara bomber jacket by Gitas Portal – Gitas Portal is a designer that really delivers on stylish Ankara pieces. Now how chic is this bomber jacket? Santa, all I want for Christmas are stylish Ankara jackets (please and thank you!). 13. 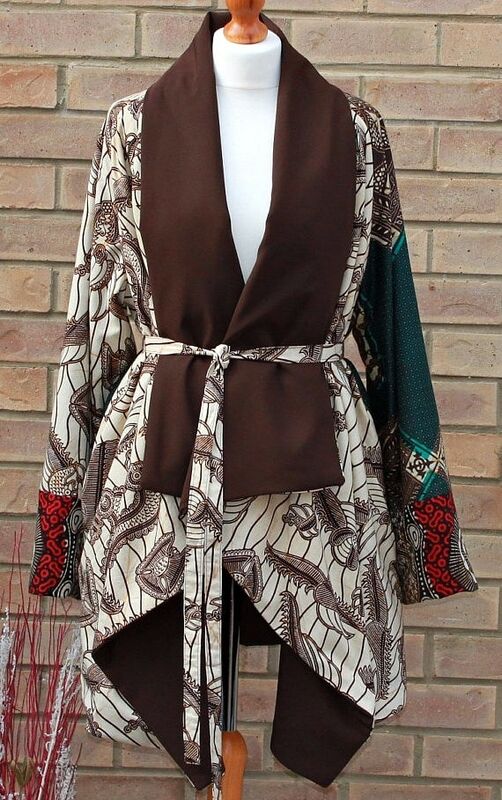 Nabla jacket by Akassi the brand Studio – To mix things up a bit, check out this longline Ankara jacket. This style is definitely trending this season. Why not take it up a notch by going with a jacket made with Ankara print? 14. Orange peacock Ankara bomber jacket by Gitas Portal – Words can’t begin to describe how elegant this Ankara bomber jacket is. Simple yet so chic. 15. African print jacket by Abrefi Fashion – A round of applause for this wrap-around African print jacket that also doubles as a top. The bold neckline and super-sized sash make me want to add this number to my wardrobe, pronto! 16. 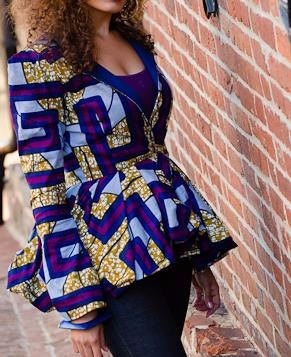 African wax print jacket by Buy The Dress – Big, mildly puffy shoulders, deep neckline, and voluminous asymmetrical peplum details make this beauty rank high on my list of stylish Ankara jackets. Oh and it is lined with a contrasting print that makes it stand out even more. I need this jacket already. 17. 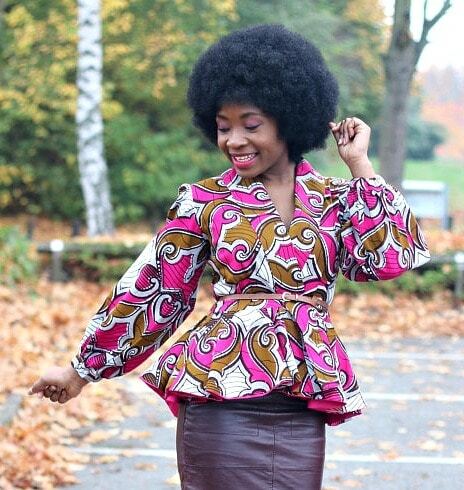 Dottie ankara jacket by Chenayii – The cut of this jacket makes it stand out. Buttonless and zipless with the perfect je ne sais quoi for a stylish work wear. 18. 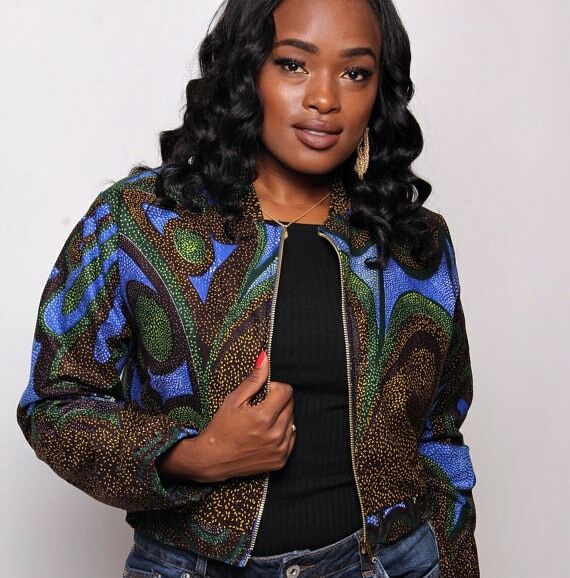 Amora jacket by Tribal Grove – The tie-front knotted skinny bow and voluminous puff of this Ankara jacket cannot be ignored. In fact, I want both the jacket and the pants. 19. 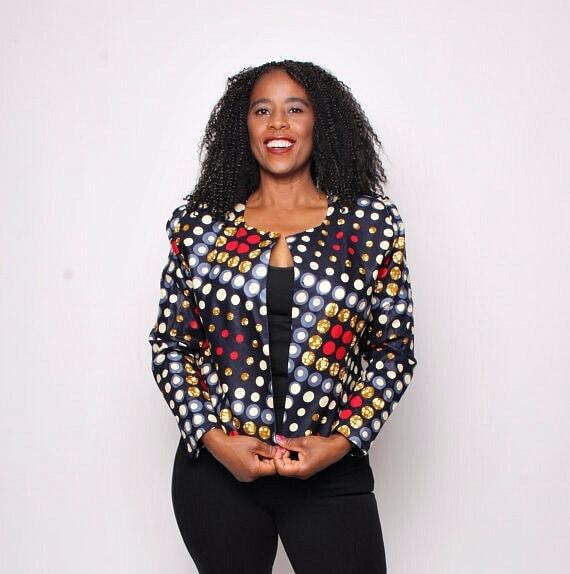 Quistt blazer jacket by Quistt – I love African print and much more so when it is used to make a versatile outfit. This blazer jacket will keep you warm plus the bold chunky belt accentuates the waist like no man’s business. 20. 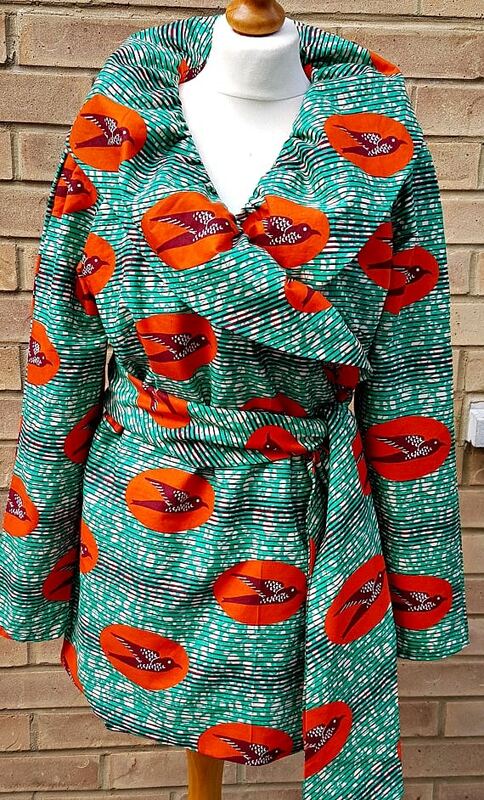 Ankara print jacket by Abrefi Fashion – This loose-fitted and I bet, super comfortable stylish jacket definitely puts a spin on traditional Ankara jackets. The unique color combinations and seemingly different fabric will get folks asking you where you got it from. And the skinny belts defines the curves, making the ruffles sit nicely on your hips. 21. The Nasb Dami blazer by Nasbstitches – Pieces like this make me fall in love with African print over and over again. Throwing back to old-school style with this beautifully crafted blazer. The bishop sleeve and gathered high-low peplum hem makes it a must-have. 22. 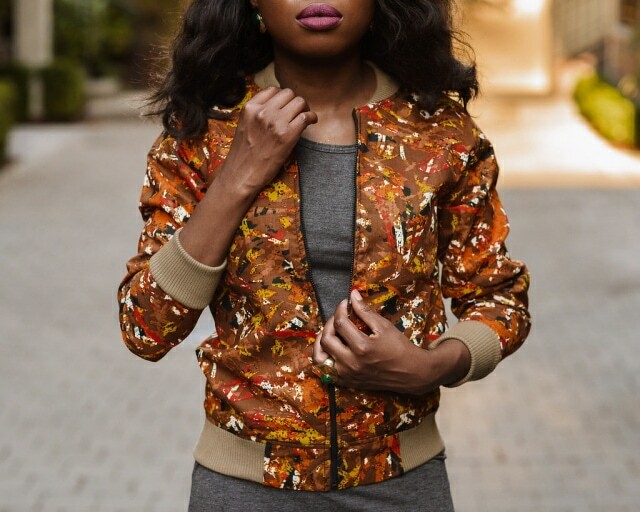 Tantie bomber jacket by Melange Mode – Made with a brightly colored Ankara print fabric, this bomber jacket gives off an urban appeal. This is a fun jacket to add to your fall wardrobe. 23. 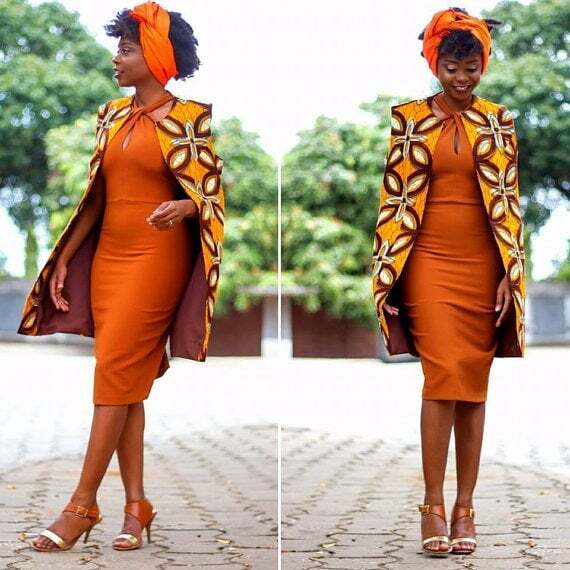 African cape jacket by African Dress Shop – Bring out the inner Be-you-cé in you with this badass cape jacket. This beautiful piece by African Dress Shop will get strangers wondering if you’re a celebrity, yess! 24. 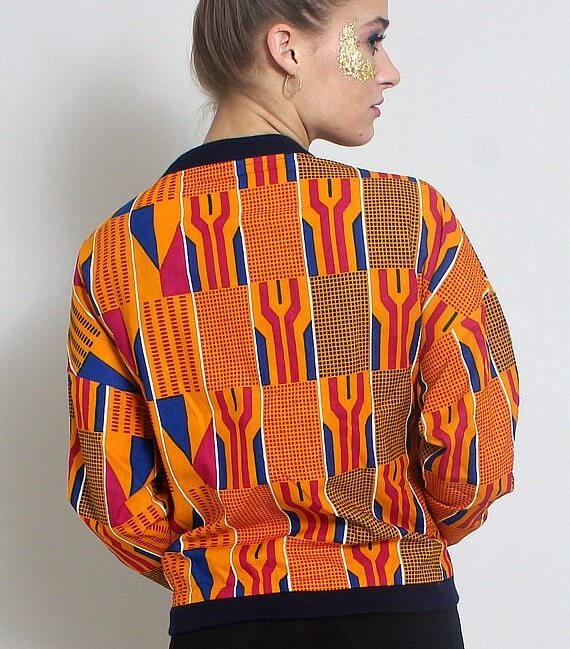 Cara Kente bomber jacket by Demouilpied – If you’re still craving more African print jackets, this Kente bomber jacket will surely satisfy your desire. The bright orange and blue colors contrast with bold white stripes make this jacket stand out. 25. African Print (Ankara) Bomber Jacket by Boriah Clothiers – Gotta love this atypical print Ankara bomber jacket. The mixtures of brown and subtle yellow colors make it a great replacement for boring coats and jackets. It’s a wrap my friends! When next you pick out clothes to wear, think about mixing things up a little with a nice Ankara jacket. African prints can be worn in a plethora of ways and Ankara jackets are one of the many ways you can show some ethnic influence on your style and stun your friends and coworkers. Nice fashion love your designs.. Thanks Joan. The designers of these ankara jackets did a phenomenal job. My wife was telling me that she wants a ankara print jacket for Christmas. I had no idea what that was so I decided to do some research. I think these designs are pretty neat and can see why my wife wants one! I think she would like the bomber jacket style so I will look into getting her one like that.